Not nice, but I can’t help it. The worst thing is that I don’t know when it will hit. So the best thing is to be proactive. Most days are routine, and I know what to expect. Breakfast at 6:30, lunch at 12:30 and dinner at about 7. I know what to expect, so I can plan for it. But some days are out of the ordinary. If I’m going to a dog show, for example, I never know when lunch will happen, if it does at all. So I bring snacks! Healthy snacks that I can grab when I’m taking the dog for a potty break between agility runs, or before we go into the obedience ring. Old fashioned “GORP” is a big favorite! That’s Good, Old-fashioned Raisins and Peanuts. Healthy and filling, not to mention yummy. 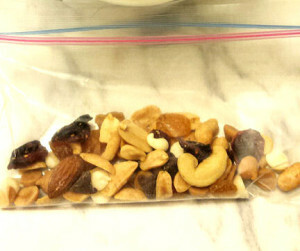 I might substitute almonds for the peanuts if I’m feeling virtuous. Or add a few M&Ms if I’m feeling daring! A handful of GORP and I’m good to go!